First swimmers needed to be on the lookout for Mary Lee the Great White Shark. Now it’s Portuguese man-o-wars, potentially lethal jellyfishlike organisms, that are washing ashore in New Jersey and New York. A boy was reportedly stung on Fire Island today, after encountering the creature on the beach. He was hospitalized but said to be okay. There were also reports Tuesday of man-o-wars on beaches elsewhere on Fire Island, and at least two were spotted along the water in New Jersey. 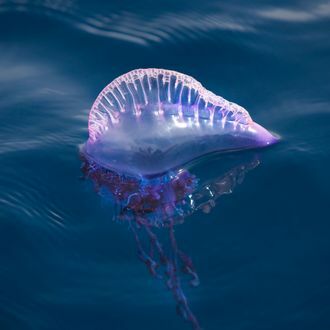 In case you encounter one of these gelatinous beings on the beach, a little science for you: Though they look like huge and terrifying jellyfish, they’re actually made of tiny organisms called zooids, and their stings are poisonous and much more painful — and, in rare cases, can be deadly — than your average Jersey Shore jellies. Man-o-wars are usually found in warmer waters, but you already knew that from reading Old Man and the Sea in junior high.